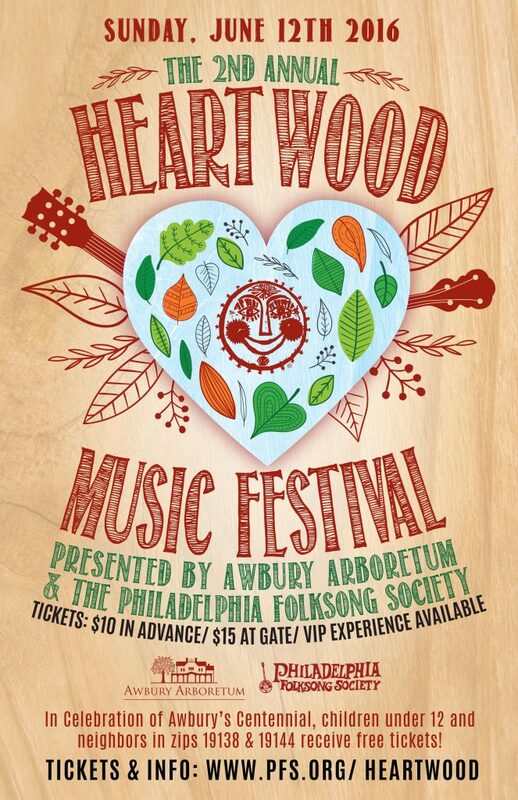 After an incredible first year in 2015, the Philadelphia Folksong Society and Awbury Arboretum are proud and excited to present the 2nd Annual Heartwood Music Festival!!! On Sunday, June 12th from 11am-6pm, join us at this year-old, one-day Festival that will feature feature the very best in local music, food, crafts, and more all set amongst the meadows and trees on the stunning grounds of the jewel in Germantown – the Awbury Arboretum! Start your Summer by kicking back and enjoying phenomenal performers and a fun-filled day, perfect for any age! The Philadelphia Folksong Society could not be happier to partner with The Awbury Arboretum for the Heartwood Music Festival as they are celebrating their Centennial this year! The Awbury Arboretum has been engaging with friends and neighbors through educational programs and events, and partnering with local educational organizations to utilize Awbury’s landscape and historic house as an active community learning center and context for place-based education for a 100 years now! The Philadelphia Folksong Society is dedicated to preserving the past, promoting the present, and securing the future of folk music and related forms of expression through education, presentation, and participation through popular programs such as The Philadelphia Folk Festival, Fall Fling, Spring Thing, and Cabin Fever Festival. Seasonal programming of workshops, community service programs, concerts, PFS Presents…, Sings, and the Odyssey of American Music programs serve a diverse range of participants-members in the community, volunteers, artists, students, partner organizations, and PFS members. In celebration of the Awbury Arboretum’s legacy of free access to the 55-acre historical landscape and house 365 days a year, children under the age of 12, AND neighbors to the Awbury Arboretum resigning in zipcodes 19138 and 19144 receive FREE tickets to the Heartwood Music Festival to honor the Awbury Arboretum’s centennial! Tickets are ONLY $10 in advance and $15 at the gate! VIP Heartwood Experience tickets available! Modeled after the beloved Philadelphia Folk Festival’s Friend of the Festival program, the VIP Heartwood Experience will provide a cool, comfortable, and shaded area to sit and enjoy the Festival in its entirety, along with refreshing snacks and beverages throughout the day, and a VIP Heartwood waitstaff to purchase additional food for you so that you don’t have to leave the tent and miss any music! VIP Exclusive artist meet and greets will allow you the chance to meet the Heartwood performers. WE CANNOT WAIT TO SEE YOU ALL THERE!!! FULL LINEUP ANNOUNCEMENT APRIL 28, 2016! BUY NOW AND SAVE!